We know that Fall is coming once you start seeing cinnamon scented pine cones popping up at the grocery store. The familiar scent is one of my favorite indicators that cold, crisp nights are on the way. It’s also a great memory from childhood. My grandmother would have them everywhere in her apartment, every year. Cinnamon scented pine cones are by far the most popular scent, but it isn’t the only option! Why not take scented pine cones further? Classic cinnamon is great, but many other fragrances that would be great for the Fall Season. Why not try a Creamy Cappuccino scent for all those coffee lovers? Or our cozy Fall Sweater Fragrance to give those pine cones a warm and inviting smell. There are countless options for scenting pine cones. 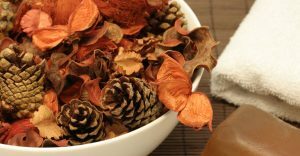 How do you add fragrance to a pine cone you ask? Here the method I used, however it may vary depending on the environment you live in. Collect pine cone from your yard, or even a neighbors *with permission of course*. 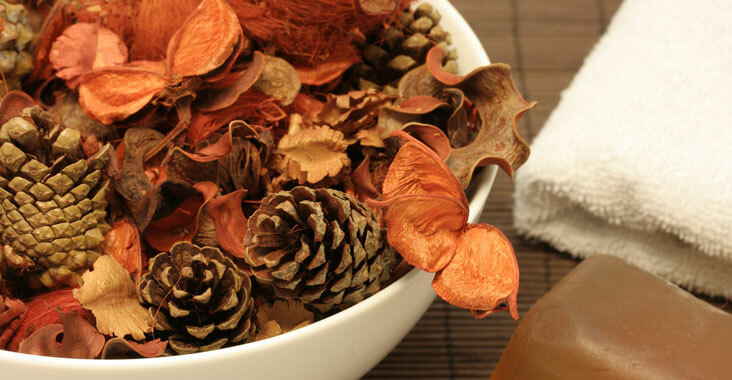 Rinse the pine cones with hot water just enough to remove dirt and other impurities. Let sit outside in the sun for 2-4 days. Or until they have completely opened and dried. Add the pine cones and slowly drizzle fragrance. Seal the bag and give it a good shake. 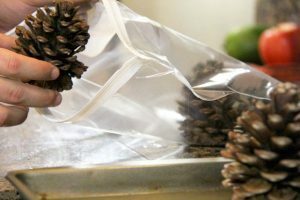 let the pine cones sit in the bag for about a week. What do you do with a scented pine cone? There are tons of pine cone inspired crafts on social media sites like Pinterest. You can make ornaments, parts for a Fall theme wreath or centerpiece, there are just so many options. You can also make a fire starter such as Martha Stewart made here: (source). We carry Beeswax and Epsom Salts just like she she used to make a sparkling fire starter. It sure does! I made one myself and tried it out in the fireplace at home. It lit well and made the outdoor area smell like pumpkin pie. The Epsom salts did sparkle a little bit and it kept a good flame. However be aware that the beeswax will drip down into the fire place and keep burning.